The Ancient Sunken City Tour is a combination of our Medieval Castles Nafplio Tour and our Wilderness Tour, combining the famous Ancient Sunken City, the Small Ancient Theater of Epidavros, with breathtaking and wild scenery, pine trees hanging above the turquoise coloured waters of Argolida’s coastline and wonderful secluded beaches for our stops. Departing from the port of Old Epidavros, we follow the coastline - an untouched and sublime landscape, passing by dense vegetation, stopping at pristine isolated beaches along the way towards our historical sites. Our first site is the Small Ancient Theatre of Epidavros, built in the 4th century B.C. Our second site is none other than the Ancient Sunken City built 1200BC, also known as Argolida’s Lost Atlantis. In some places the ancient breakwater is still preserved. Only two meters in depth, this makes it a terrific location for underwater site-seeing, snorkelling, underwater pictures. After admiring the ruins of the Sunken City, and enjoy our first snacks of the tour, we visit the stall of Athina Eco-farm where we enjoy local traditional delicacies, all produced the same way they were produced during the ancient times. The owner of the farm will share with you all the knowledge he has on the way ancient Greeks produced their products and taste the difference to the modern way of production. When we manage to convince you to move on, we paddle to a pristine, isolated beach to have our homemade lunch. After some snorkelling, sunbathing, or why not a siesta, we can finally admire the journey back, with all senses having been satisfied and fulfilled. Sea Kayaking tour, snorkeled sunken city, hidden beaches, amazing local tasting and wonderful homemade local meal on secluded beach! We had the most spectacular time with Alex, the tour itself was amazing, Alex made it perfection! Don't go with any other or you will be disappointed. The beaches and water are absolutely beautiful, conversation was lovely, food was unexpectedly delicious (a real meal!) this was the highlight of our trip to Greece! We will be back, thank you Alex! There is a reason this is so highly rated, and words are not enough to describe it, you will just have to try it yourself! Alex and Panajotis thank you again for such a memorable day! Kayaking and a LOT more than Kayaking !! Alex likes what he does and you can feel it. We highly recommand PanExpeditions and will come back for another tour when in the area for sure ! Fantastic day trip - it made our holiday!! I really can’t recommend this trip enough, myself and partner travelled with our 13 year old son and we all thoroughly enjoyed the whole day. The trip was brilliant from start to finish, a must for any holidayers in the area! Alex is wonderful. He is an excellent guide and he made our trip amazing. One of the best parts of our trip! I recommend Alex and his company to anyone who visits this area of Greece! It was a full day and definitely worth it! Thank you Alex!! 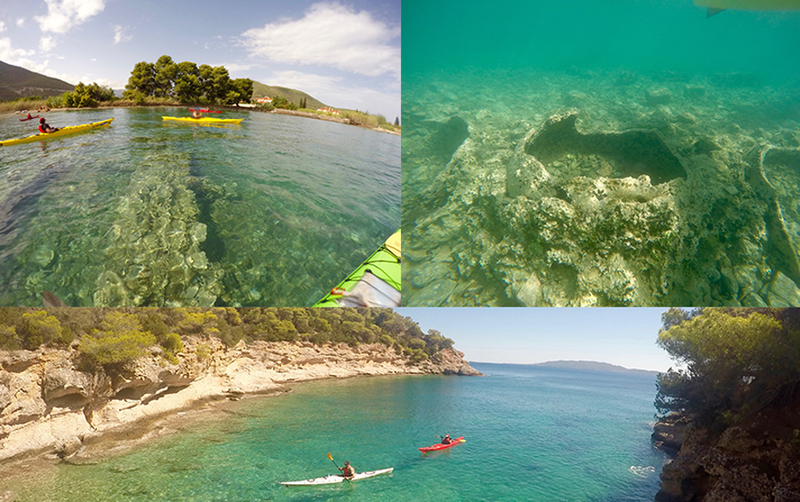 Great Guides for our Ancient Sunken City Kayak Tour! Could not have asked for better guides with Alex and company! Made lots of memories with our guides and friends and "grandma's" lunch! I think they are probably the most experienced guides I have ever come across. So what ever trip you choose you will certainly have the most memorable "Panexpedtion" experience. We -my husband and two young kids-went on the Ancient Sunken City tour today. Everyone had a fantastic time kayaking and snorkeling. Alex was full of amazing information, from Greek history to sea life. The food was delicious! Thank you Alex and Savos for being wonderful hosts. We would highly recommend to all- the expert kayaker to us, novices and slow paddlers.